My low-carb life is moving forward fairly smoothly. I find it very easy to eat at home, pretty easy to eat out, but a little tricky when I’m at someone else’s house. This is good news for my friends since I keep offering to cook dinner here. Steaming rice or whipping up some garlic bread is easy enough to serve to everyone else, and I just put meat and vegetables on my plate. With so many local vegetables and a lot of good quality meat readily available in Ukiah, it’s mostly a pleasure to eat 60% vegetables, 35% meat, and 5% dairy. Just because I’m restricting my diet doesn’t mean I’m not eating excellent food. 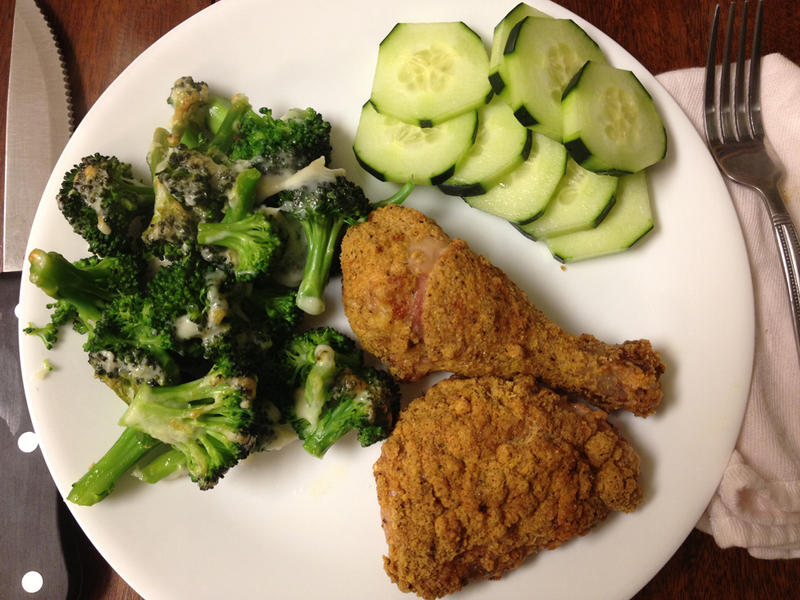 Here’s a fabulous low-carb recipe my friend Casey turned me onto: oven fried chicken using pork rinds and Parmesan cheese as breading. GENIUS. Preheat oven to 350 degrees. Grease or cover a baking sheet with tin foil. Rinse and pat dry the chicken pieces. For even cooking, take the chicken out of the fridge 20 minutes beforehand so it’s not so cold when it goes into the oven. In a blender, combine a whole bag of pork rinds with 3 tablespoons Parmesan cheese and whatever seasonings you like. There’s really no right combination of ingredients – these are just guidelines. I’ve done it several ways and it’s been delicious each time. Lightly beat the eggs. Dredge each chicken piece in the egg wash and then coat in the crumbs. Arrange the coated pieces on the baking sheet and place a small pat of butter on top of each piece, or melt 3 tablespoons of butter and gently spoon on top. This chicken is crispy and flavorful. It’s in no way low fat – definitely a comfort food, but one I feel good about eating. I’ve never been anti-fat and I don’t plan to start now. I’ve served this with different sides: sauteed greens, baked broccoli with a little cheese, mashed cauliflower. While Carson eats rice, I have sliced cucumber or turmeric marinated cauliflower. For lunch the next day I pop leftover pieces in the oven and they crisp up again nicely. This is a new favorite for sure. Once I get some of my friends’ pictures, I’ll post about my whimsical weekend in Fort Bragg.